Grelos are leafy greens similar to broccoli raab. They are the emblematic vegetable of Galicia in northwest Spain. I bought this bunch at a supermarket near my home in southern Spain. 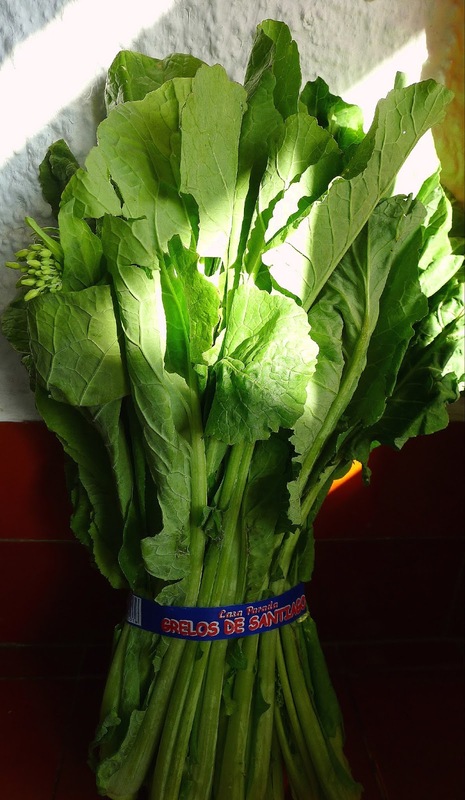 Finding a big bundle of leafy greens—grelos—at a local supermarket transported me back to Galicia where I first encountered grelos years ago. Here are some excerpts from my trip. Galicia, which occupies the northwest corner of the Iberian peninsula, a chunk of Spain set above Portugal, is like another country altogether. Green pastures, Atlantic mists and grey stone remind you more of Brittany or Wales, perhaps. 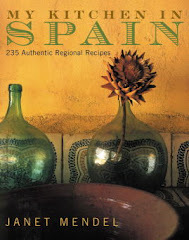 Certainly not of Mediterranean Spain, which is where I live. We drove through rolling countryside where spumes of mist floated over the green of vineyards, in and out of chestnut forests, through small villages. Interior Galicia is intensely rural. Small garden plots are tended by women, who seemed everywhere to be digging in the dirt—hoeing, sowing, weeding, plowing behind a team of oxen. Around lunch time we stopped at a village shop that doubled as a bar and restaurant, and bought cheese, ham, tomato, and the local wine, intending to put together a picnic. But the shop had no bread. The shopkeeper, a woman, who also tended the bar and two small children, directed us through a village backstreet, past hórreos, to the panadería or bread bakery. We bought a simple wheaten loaf; admired a roscón, a sponge cake baked in a ring mold. The village baker, having sold most of the morning’s loaves and banked the oven’s fires, was disposed to chat with a couple of foreigners. Turns out he was also the postman, so could tell us local lore. We pointed across the road. What are those plants growing in that garden? We had seen them in fields everywhere—stalks, about knee-high, with big leaves. He said it was grelos, a member of the turnip family. The stems and leaves are cooked with pork and potatoes. The root of the plant, a knobby turnip, goes for animal fodder. My bunch of grelos inspired me to try some Galician recipes. 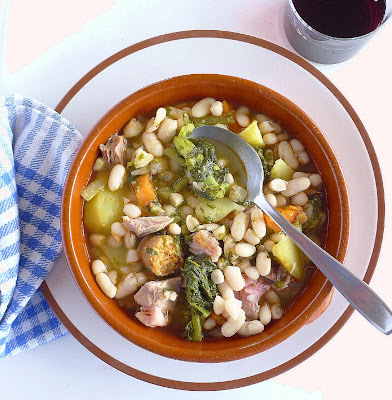 The two most typical are caldo gallego, a soup with pork, potatoes, white beans and grelos, and lacón con grelos, greens cooked with cured pork shoulder, plus the essential potatoes. Galician soup, caldo gallego, has chunks of cured pork, chorizo, potatoes, white beans and grelos. An adaptation of lacón con grelos--roast pork hock with grelos and potatoes. 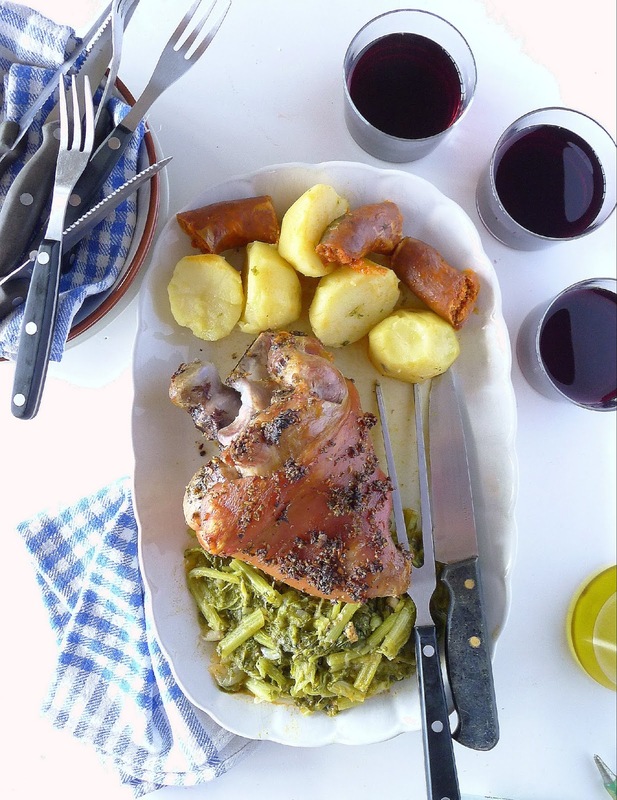 Serve this meal with a red wine from Ribeira Sacra. I had my grelos, but now I needed the lacón. 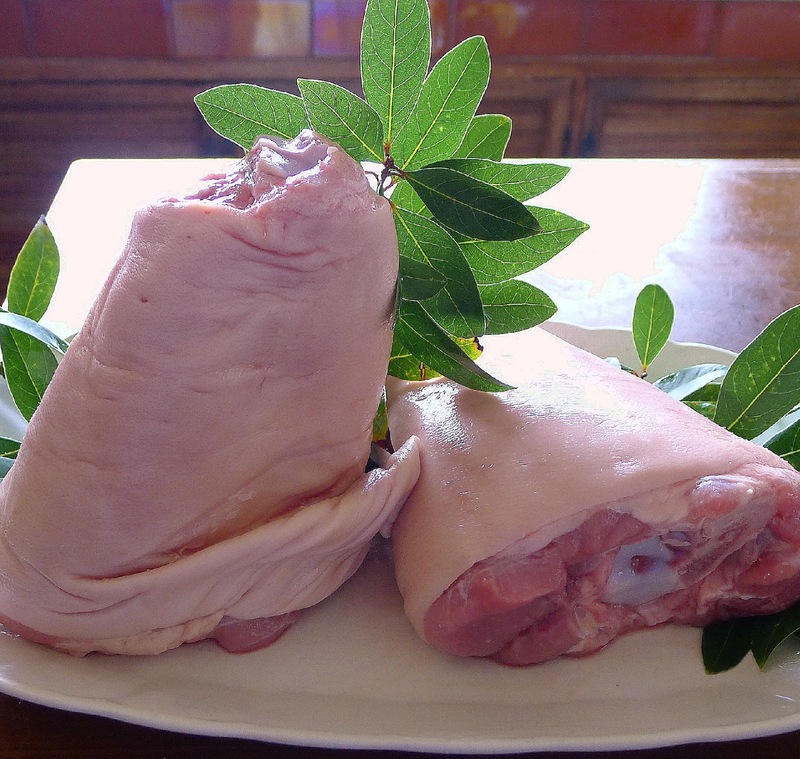 Lacón is the Galician term for the front leg of a pig, fresh or cured. Cured lacón is more like American southern country ham than like Spanish serrano ham. It’s salt-cured and air-dried, sometimes smoked. After curing, lacón has to be soaked in water to remove the salt, then fully cooked, either by simmering in water or roasting, before eating. Once upon a time in a bar in Orense. A van pulled up at the curb and the baker’s boy got out carrying a huge tray, squeezing past us to deliver it to the bar. The tray held a whole lacón (front leg) of roast pork. The barman poured off the juices into a pitcher. Then he sliced the pork, put it on a split bread roll, crossed it with strips of roasted peppers and dribbled some of the juice over. And served us a free tapa. Delicious. I found packets of cooked and sliced lacón—perfect for sandwiches or adding to soup—I couldn’t find a big joint. Nor a whole bone-in fresh shoulder cut. 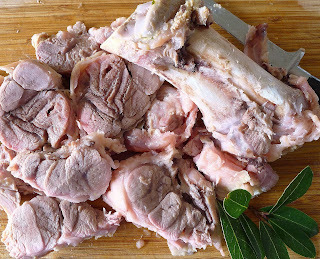 I finally settled on codillo, pork hock or knuckle, in salmuera, brine. The traditional way of cooking lacón (a bone-in piece of about 4 pounds), once it has soaked 48 hours, is to put it in a big pot, cover with fresh water and cook with sliced onion and bay leaf until completely tender (30 minutes per pound), about 2 hours. You add potatoes and chorizo during the last 30 minutes, then the grelos at the very end (10 minutes). 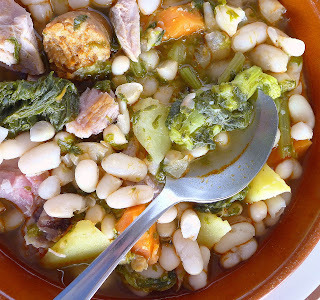 The same caldo, or broth, can be used to make caldo gallego, soup with white beans, potatoes, chorizo and grelos. 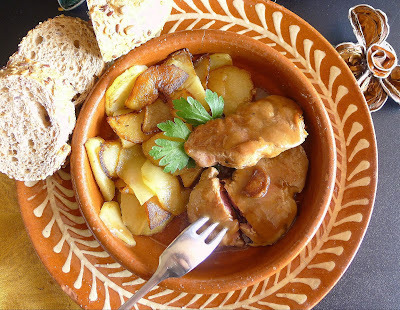 I used one of the pork hocks to make the soup and, following a recipe for lacón asado, roast fresh pork shoulder, in a Galician cookbook, Cociña Galega by Álvaro Cunqueiro, I roasted the second hock and served it with grelos, chorizo and potatoes from the caldo. Traditionally, the lacón and accompanying potatoes and grelos are served with nothing more complicated than extra virgin olive oil to dress the vegetables. Nevertheless, I served mine with sharp mustard and a tangy salsa verde. 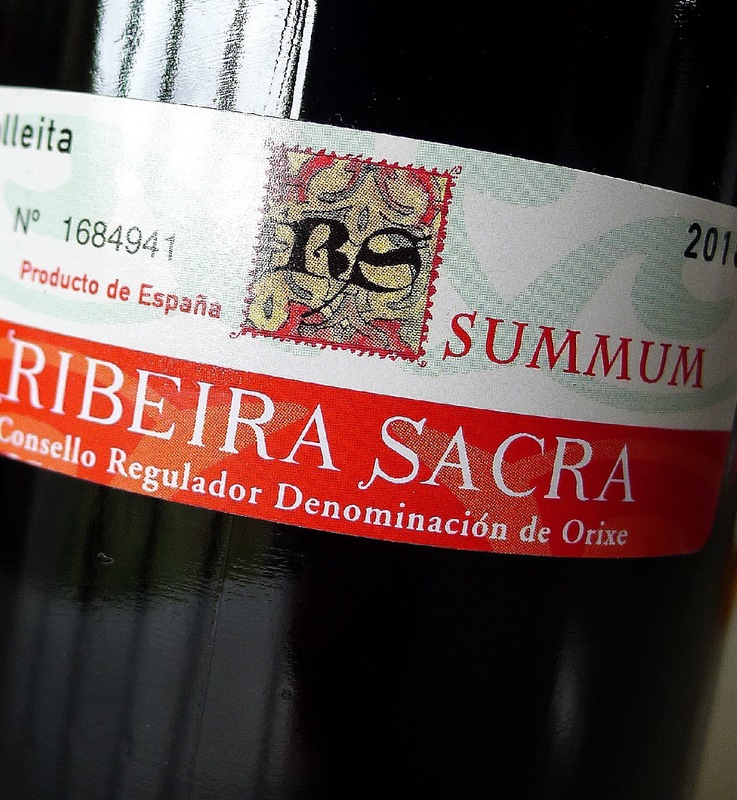 To accompany the food, try a red Mencia wine from Ribeira Sacra, the Galician wine that’s not Albariño. “Ribeira Sacra” means “the banks of a holy river”--so-called because the River Sil is on the pilgrims’ route to Santiago de Compostela. A string of Romanesque monasteries, dating from between the eighth and twelfth centuries, occupies spectacular sites along this river bank. We caught our first glimpse of the River Sil, which cuts a canyon through the highlands, on the steep descent to the Monastery of San Esteve, which nestles into the forest over the river far below. The river is wide and twists in S-curves through green banks. If the sun is shining, the water is blue. If not, it can appear grey or even black. Leaving the car, we could hear only the twitter of birds and, somewhere nearby, the rhythmic sound of somebody hoeing in the garden. We imagined a monk tending the herbs and vegetables, but, in fact, the monastery is long in disuse. On our visit we encountered no one at all. The steeply terraced land is planted in vineyards right down to the banks of the river. 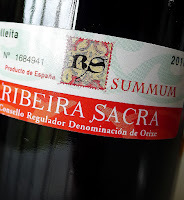 The wines of Ribeira Sacra date from Roman times, but became renowned during the medieval era, when vineyards were tended by monks in the several monasteries. Today they are small family holdings, cultivated on a very local scale. 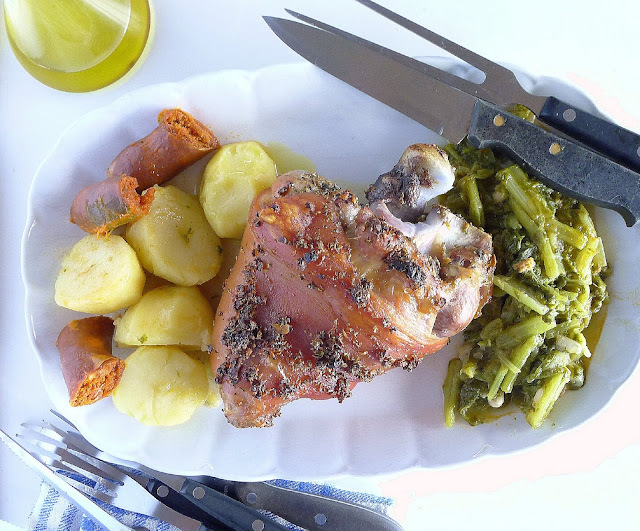 Roast pork hock (not actual lacón) served with traditional accompaniments of grelos, potatoes and chorizo, with olive oil to drizzle on the vegetables. 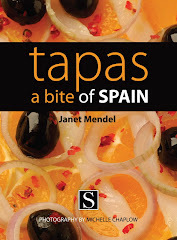 Use soft, cooking chorizo, preferably smoked Galician or Asturian chorizo. Use either ordinary sweet or smoked pimentón (paprika). If grelos or broccoli raab are not available, try turnip greens, kale, chard or collards in their place. 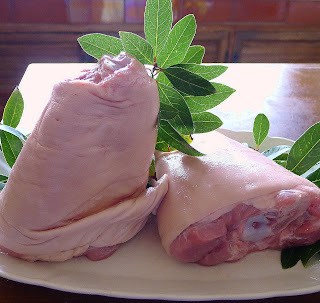 If you are using fresh pork, brine it before roasting. If you have a (cured) picnic ham or authentic lacón gallego, prepare it for cooking according to package directions. Two days before roasting the meat, prepare the brine. Bring the water to a boil. Add the salt and stir to dissolve it. Remove from heat and add 6 cloves of garlic, peeled and crushed; peppercorns, cloves and bay leaves. Let the brine cool completely. Place the pork in a non-reactive container and pour the cooled brine with spices and herbs over it. Place a plate on top of the meat to keep it submerged. Cover and refrigerate at least 24 hours or up to 48 hours. Turn the meat once a day. Drain the pork, discarding the brine. In a small bowl combine the remaining 6 cloves of crushed garlic, oregano, pimentón, pepper, oil and vinegar. Spread this mixture on all sides of the pork. Place the pork in a roasting pan and allow it to come to room temperature. Roast the pork for 30 minutes. Pour over the wine. Roast 60 minutes more. Add additional liquid (wine, water or meat stock) as needed, so there is always some liquid in the pan. Raise heat to 450ºF. Roast the pork until the skin is browned and crispy, about 15 minutes. Remove pork from the oven and place on a cutting board. Reserve pan juices. Allow the meat to stand 10 minutes. Remove skin and slice the meat off the bone. Arrange it on a platter with the cooked greens, potatoes and chorizo. This is the pork hock that cooked with beans to make caldo, soup. Pieces of the pork went back into the soup with the beans, potatoes and grelos. Cut off and discard thick, fibrous stem ends from the grelos. Discard any yellowing leaves. Fill a basin with cold water and wash the greens very well. Twist and snap the stalks into three or four pieces. Drain the grelos. 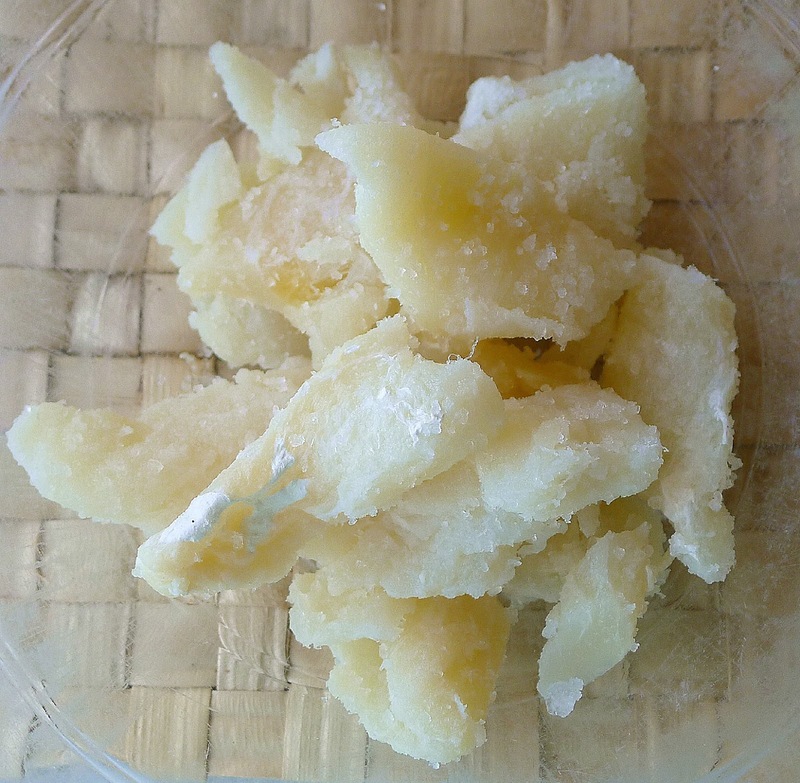 Grelos after blanching in boiling water. Bring a large pot of salted water to a boil. Add the grelos and blanch them 3 minutes. Drain in a colander and refresh in cold running water. Bring a pot of salted water to a boil. Add the potatoes and cook 10 minutes. Add the grelos and the whole chorizos. Cook until potatoes are tender, about 15 minutes longer. Remove potatoes and greens with a slotted spoon and place on serving platter with the sliced meat. Remove the chorizos to a plate. 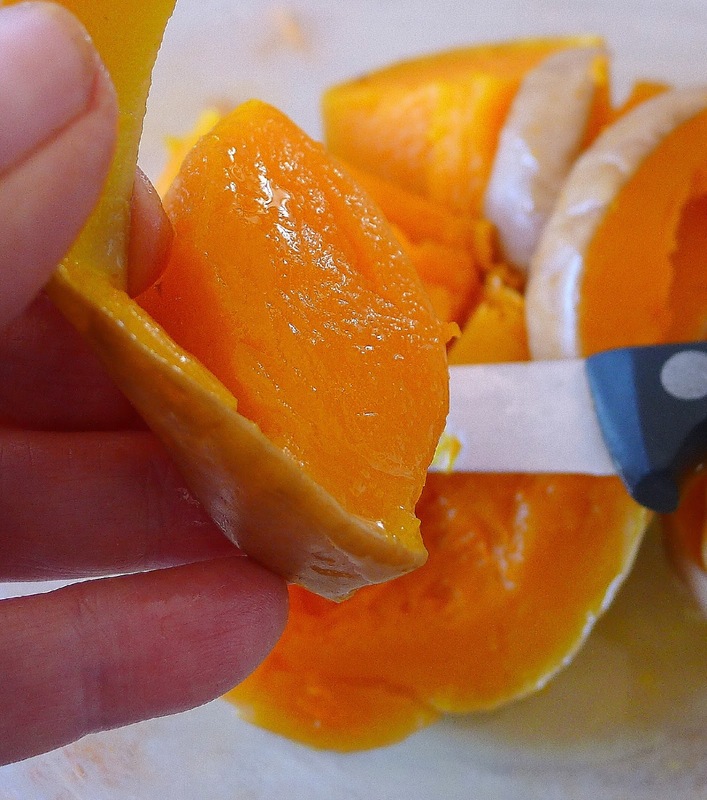 Use scissors to cut them into smaller pieces. Place the chorizo on the platter. Drizzle oil over the greens, potatoes and meat. The recipe for Caldo Gallego is here. About Grelos de Galicia IGP. Parador (hotel) de San Estevo. But, here’s a recipe for salt cod that might fool anyone! 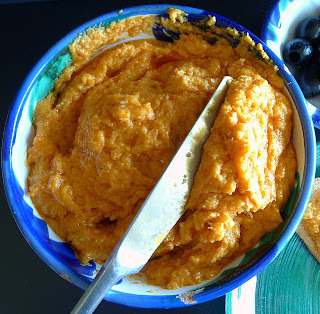 It’s a garlicky, creamy dip or schmear that might remind you of hummus or Greek skordalia or taromosalata. This one, from the Axarquía region east of Málaga, is somewhat like Catalan brandada and atascaburras or ajoarriero from La Mancha. 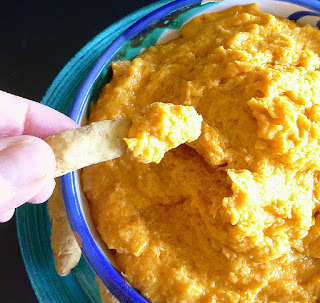 But, it has, besides salt cod and garlic, a big dose of pimentón (paprika) that gives the mixture a ruddy hue. 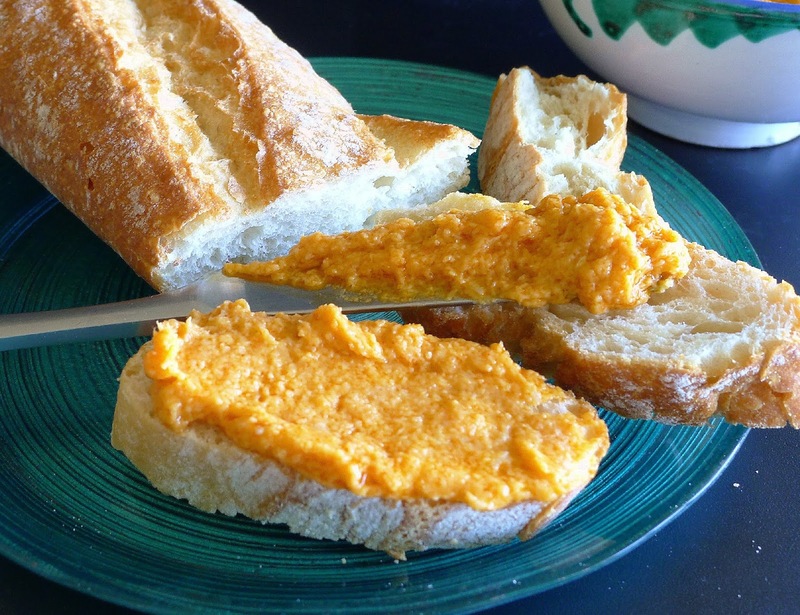 Ajobacalao is a dip or spread made with salt cod blended into a creamy mixture of garlic, bread and olive oil. Pimentón (paprika) gives it a reddish color. Spread the ajobacalao on crusty bread for a satisfying snack. A tasty spread for canapés. In Málaga, local green olives are typical, but the black ones make nice contrast. 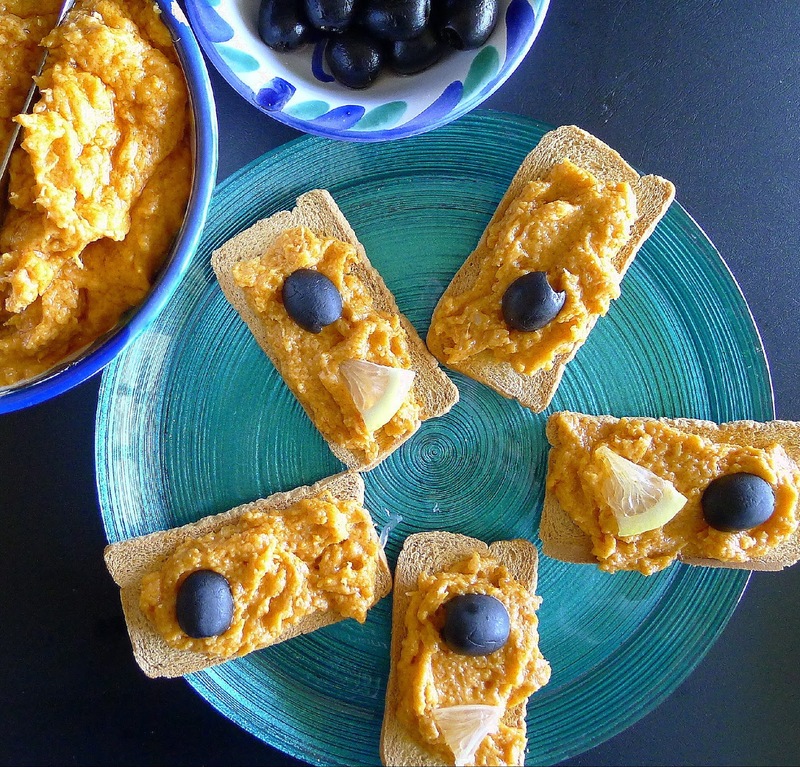 The resulting thick spread can be slathered on bread or toasts for a satisfying snack, spread on crisp crackers as a canapé or dipped with breadsticks. Serve it as a luncheon entrée with artichokes, quartered hard-boiled egg and lettuce. Salt cod is to fresh fish as cured ham is to fresh pork. The process of salting and curing changes both flavor and texture. Salt cod has to be soaked in several changes of water before being incorporated in any recipe. It needs very little cooking on gentle heat. In Spain, it’s easy to find bacalao in many different cuts. I used a packet of bacalao desmigado, scraps of cod with no skin or bones. The small pieces needed only 12 hours soaking. 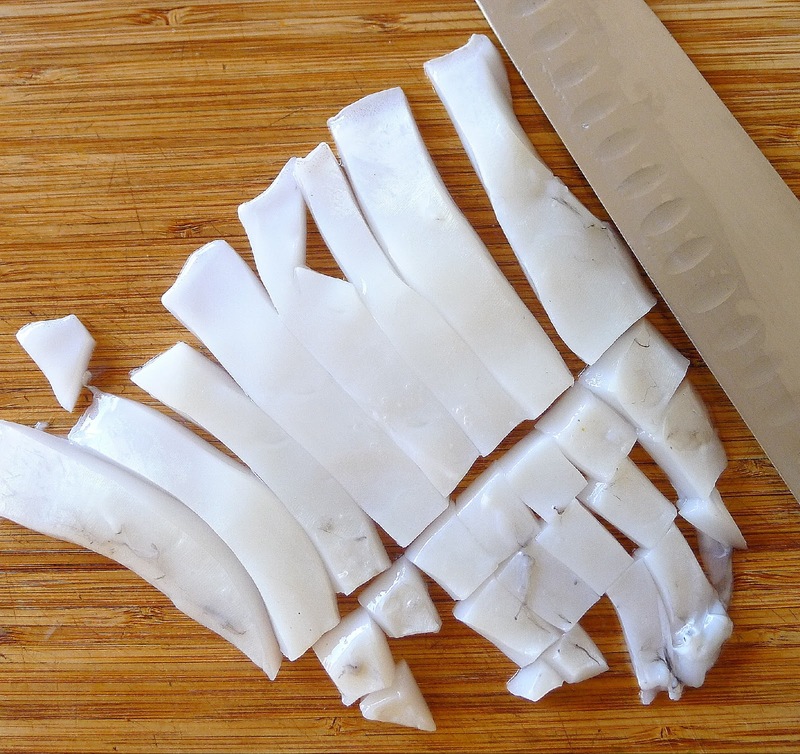 If you have a thick, loin cut of bacalao, it may need as long as 48 hours to soften and lose excess salt. In bygone times, this traditional dish was made in a lebrillo, a large clay bowl, or a wooden mortar, the ingredients mashed together with a pestle. Nowadays, a food processor makes quick work of it. It's important to mix very well to emulsify the oil and bread. Use extra virgin olive oil. 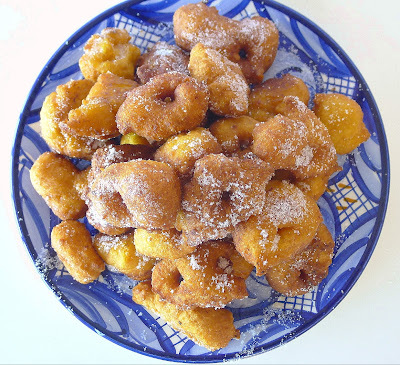 In the Málaga area where this is a popular dish during Lent (Cuaresma) the local oil is made from the Verdial variety of olive. The pimentón is normal, sweet paprika, not smoked. Use additional hot pimentón or cayenne to taste. Wash the pieces of cod and place them in a bowl. Cover with cold water. Refrigerate, covered, 12 hours, changing the water twice. Drain and rinse the pieces of cod. Place them in a pan and cover with water. Bring the water to a simmer (bubbling gently) and cook 1 minute. Drain, saving the cod cooking liquid. When the cod is cool, flake it with the fingers, discarding any skin or bones. Reserve cod and liquid. 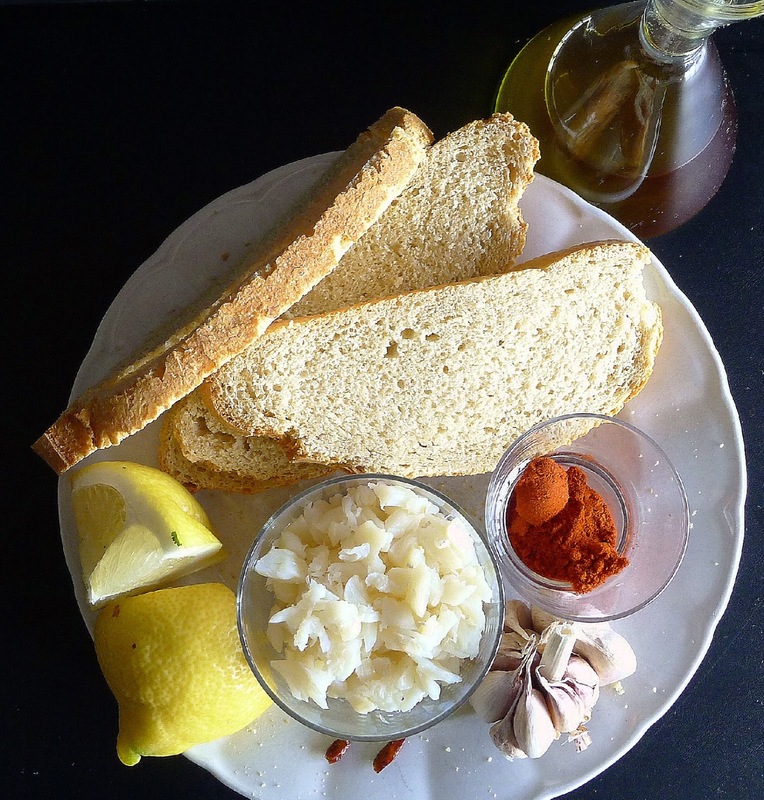 Ingredients for ajobacalao--day-old bread, extra virgin olive oil, pimentón, garlic, cod that has been de-salted, cooked and flaked and lemon juice. Finely chop the garlic in a food processor. Remove crusts from the bread. Break it up and add to the processor with the garlic. Add the two kinds of pimentón. Grind the bread into fine crumbs. Add ½ cup of the reserved cod cooking liquid and process until it is absorbed by the bread. With the processor running, slowly add the oil. Process until the oil is completely absorbed and mixture is very smooth. Add the lemon juice and 2 or 3 tablespoons more of the reserved liquid to make a smooth, thick cream. Add the flaked cod and process a few seconds more to combine well. The cod does not have to be completely pureed. Taste and add salt if necessary. Cover and refrigerate the cod until serving time or up to 3 days. 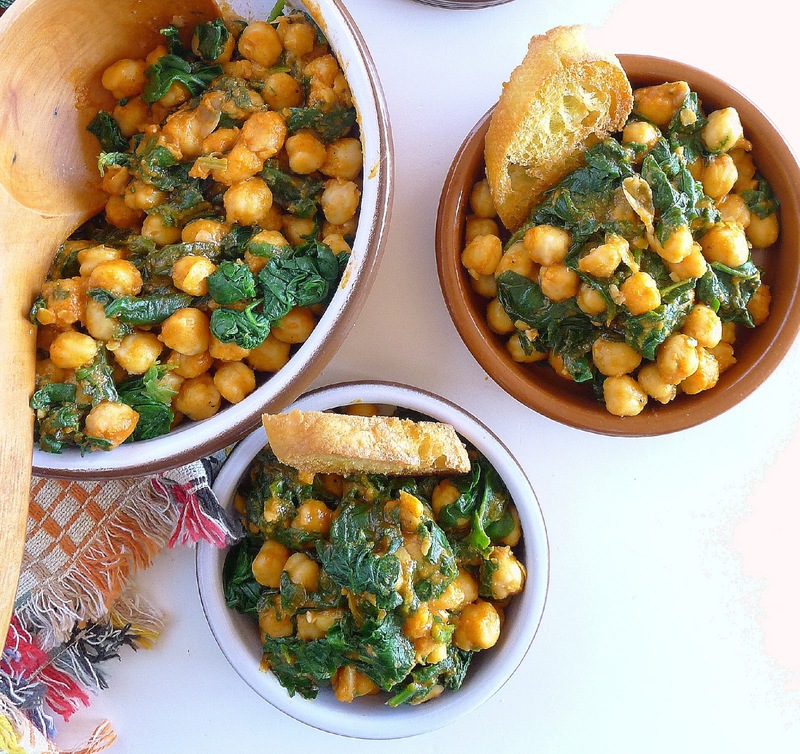 Serve with bread, toasts, breadsticks or crackers. Succulent ibérico ham. Sizzling, garlicky shrimp. Potato salad with chunks of tuna. Rings of crisp-fried calamares (squid). The possibilities at a typical tapas bar are enough to make a vegetarian weep in frustration. What to eat that doesn’t have meat, poultry or seafood? There’s always the fabulous tortilla de patatas made with eggs and potatoes (unless you are vegan and don’t eat eggs). Maybe a few salads and not much else. In Sevilla tapa bars you’ll find a traditional tapa that’s vegetarian—vegan even—and truly satisfying. 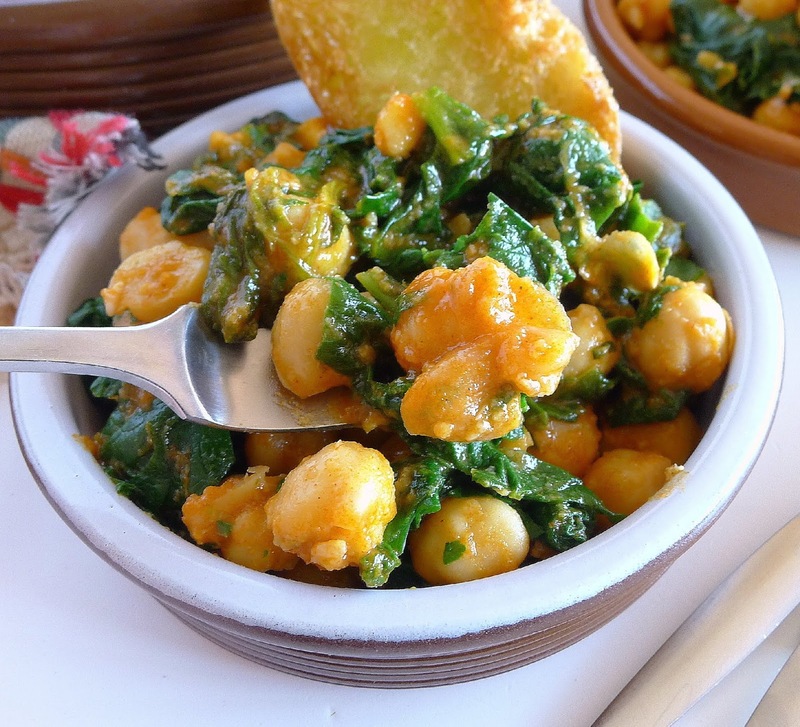 Espinacas con garbanzos, or garbanzos con espinacas—spinach with chickpeas or chickpeas with spinach. While it’s popular year-round, the dish really comes into its own at this time of year, during Lent, when observant Catholics don’t eat meat on Fridays. 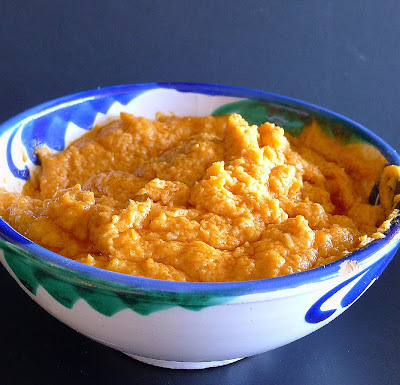 Then it’s served as a starter or main dish for a comida de vigilia or fasting day meal. A vegetarian dish of chickpeas and spinach, typical of Sevilla tapa bars. 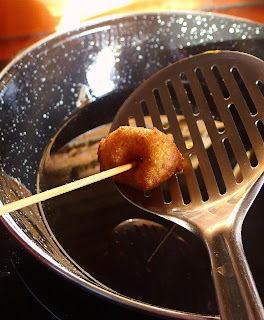 Tapa-size servings in small cazuelitas with fried bread to accompany. A main dish serving might be topped with hard-cooked egg. Olive oil, plenty of garlic, pimentón (paprika) and cumin flavor the combo of vegetable and legumes. If you don’t like the assertive flavor of cumin (it will remind you of Moroccan and Mexican food), reduce the quantity. If you want the dish even spicier, try using especia para pinchitos, a spice blend for brochettes that includes cumin as well as coriander, ginger and cayenne. 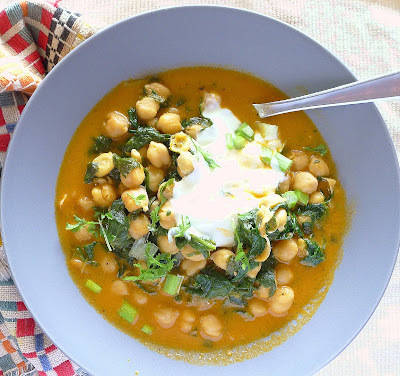 I cooked a big pot of chickpeas (1 pound) and used some in this recipe and put the rest in the freezer. You’ll need about 10 ounces dry chickpeas to make 4 cups drained, cooked chickpeas. Soak the chickpeas in water overnight (8 hours). Drain and cover them with hot water. Add salt, sliced onion, bay leaf and a whole tomato. Cook until the chickpeas are tender, about 90 minutes. Save the cooking liquid to use in the recipe. Add the cooked and skinned tomato to the bread and garlic in place of chopped tomato. In an attempt to keep the fresh spinach bright green, I cooked it very briefly then plunged it in ice water before draining. I added the spinach to the chickpeas at the very end of cooking. This made for an attractive dish. However, when I reheated leftovers the next day, the spinach turned dark. Though, it was just as delicious! 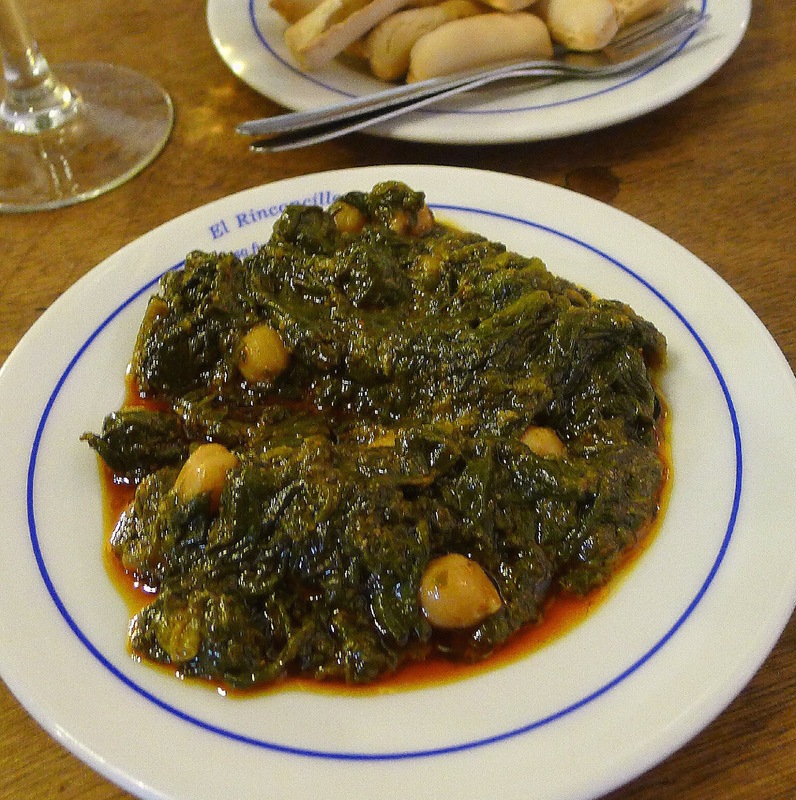 As served at bar El Rinconcillo in Sevilla, the dish has more spinach than chickpeas. 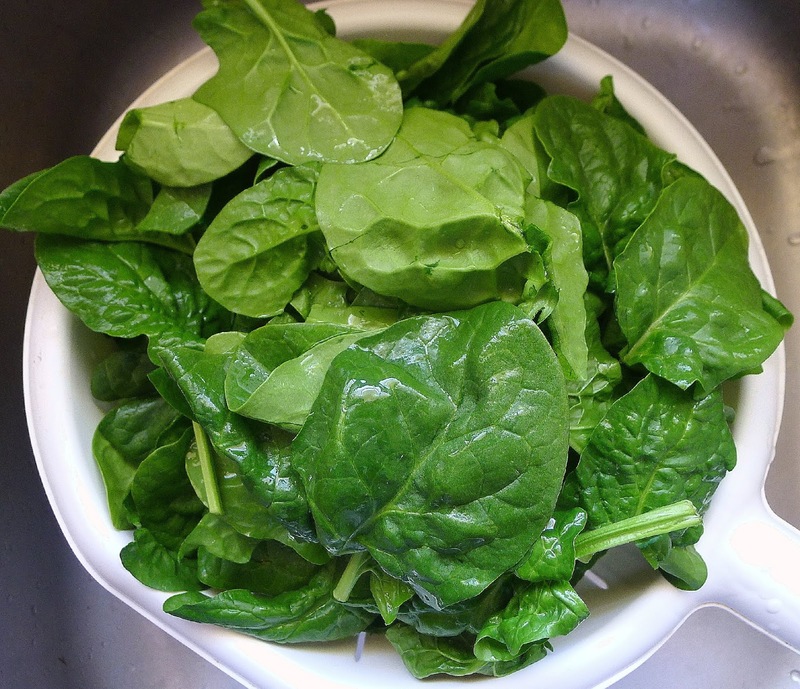 Spinach slow-simmered with the spices loses its fresh green color. In Sevilla tapa bars, the dish is usually made with lots of spinach and few chickpeas. But it is just as authentic the other way around, which is how I decided to make it. It’s not a soup. Add enough liquid to the chickpeas to keep everything juicy, but not soupy. 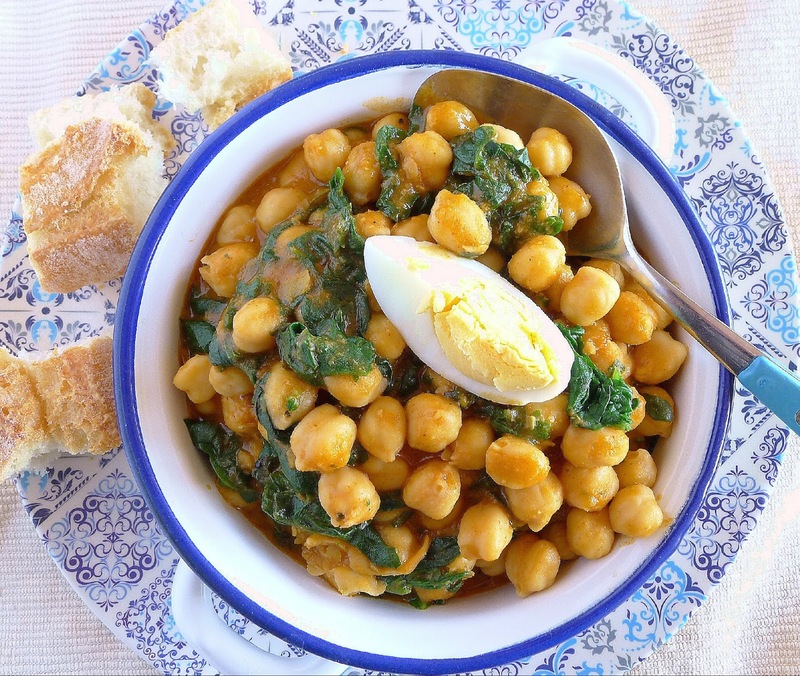 If you’re cooking chickpeas from scratch, use the cooking liquid. If you’re using canned chickpeas, use water. The pimentón (paprika) is ordinary sweet pimentón, but a smidgin of smoked pimentón in addition adds a nice background flavor. Hot pimentón or cayenne is optional. 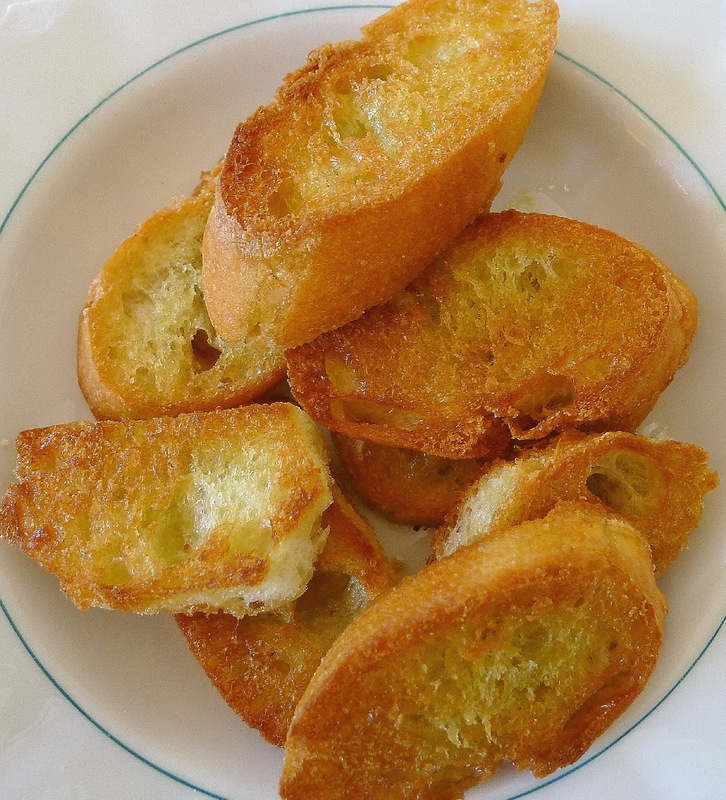 Fried bread for thickening the sauce and to serve as an accompaniment to the finished dish. 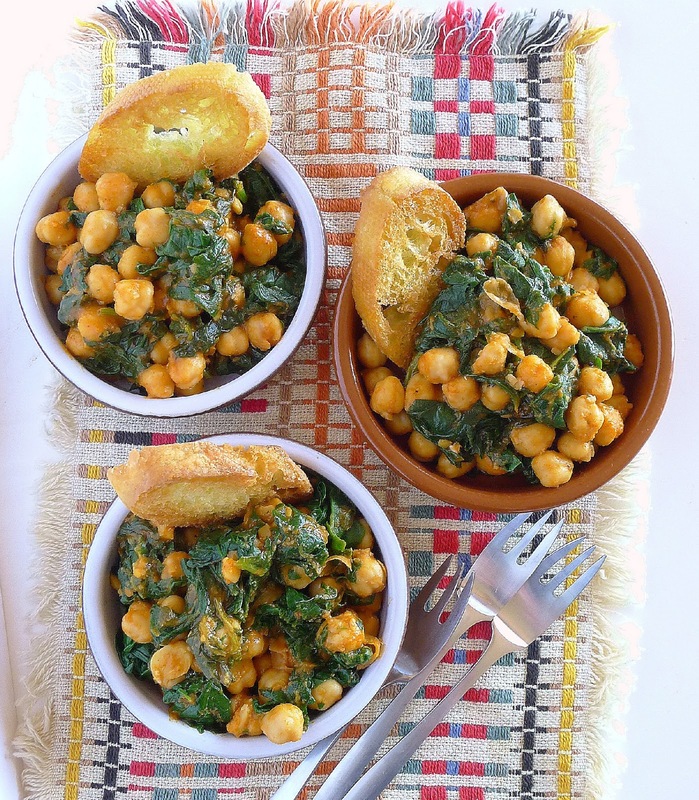 A few slices of fried bread go into the blender to thicken the chickpea liquid. If you want to serve fried bread with the dish, fry more slices at the same time. This is the lechoso variety of chickpea, generally used in Andalusia. It is plumper than the castellano varieties. 4 cups cooked and drained chickpeas. 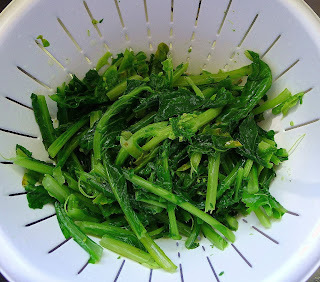 Chop spinach after blanching in boiling water. Bring a large pot of water to a boil. Have ready a bowl with ice and water. Add the spinach to the boiling water and cook 1 minute. Skim it out and into the ice water. 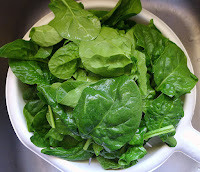 When spinach is cooled, drain it well and squeeze out excess water. Chop the spinach and reserve. Heat the oil in a deep skillet or pan. Fry the slices of bread until golden-brown on both sides. Remove. Add the peeled garlic to the pan and fry until golden. Remove. Break up the fried bread into a blender container. Add the garlic and ¼ cup of cooking liquid or water. Add the vinegar, pimentón, hot pimentón, if using, cumin and tomato. Blend to make a smooth paste. Stir the bread-garlic paste into the oil remaining in the pan and fry it for a minute. 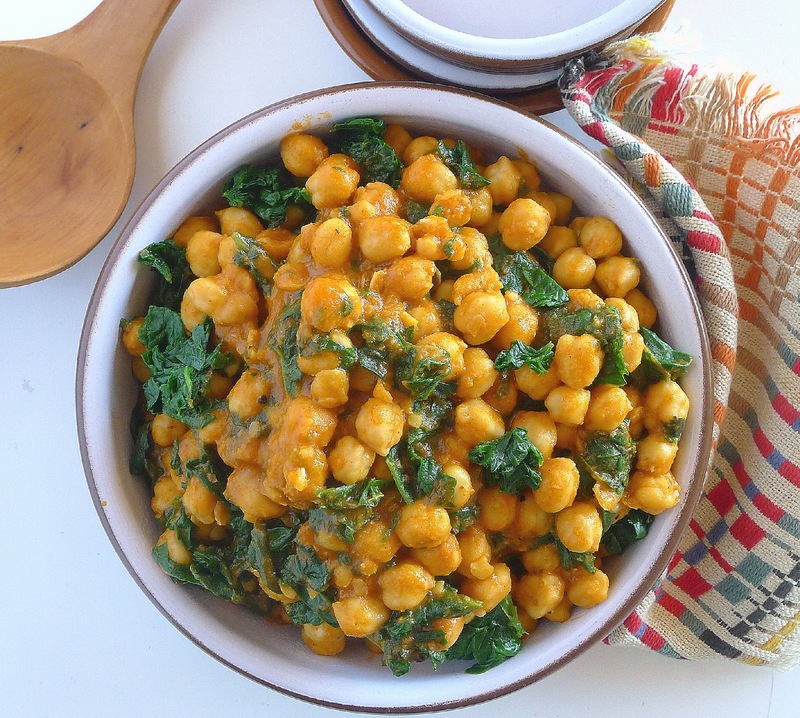 Add the chickpeas and about 1 ½ cups of the chickpea cooking water. Add salt and pepper to taste. Bring to a boil, reduce heat and simmer 15 minutes. 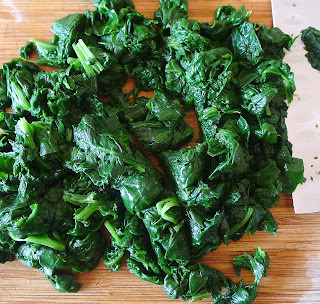 Immediately before serving, stir in the chopped spinach. Heat thoroughly. Serve the chickpeas and spinach in bowls with quartered egg, if desired. 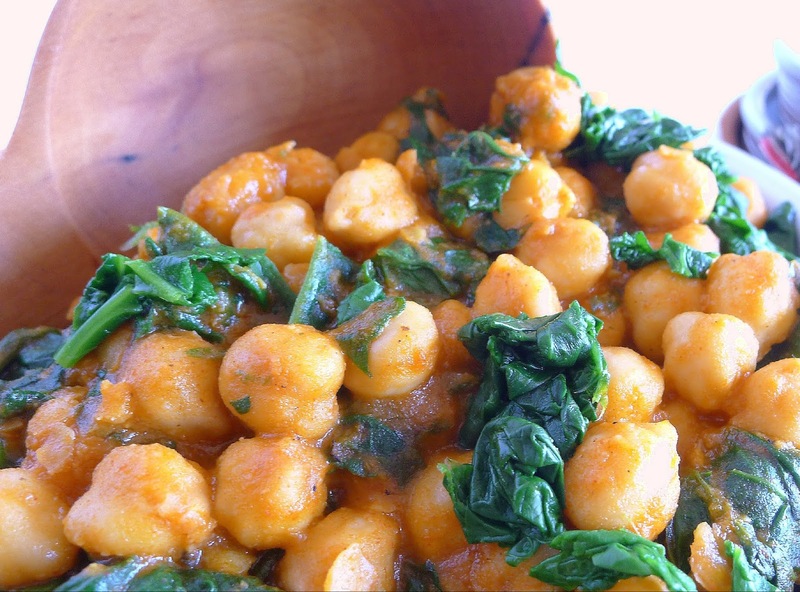 Chickpeas and spinach are saucy, not soupy. Leftovers the next day: I added more liquid to make a soup and garnished with a dollop of Greek yogurt, chopped green onions and chopped cilantro. Eggs Baked in Spinach Nests. 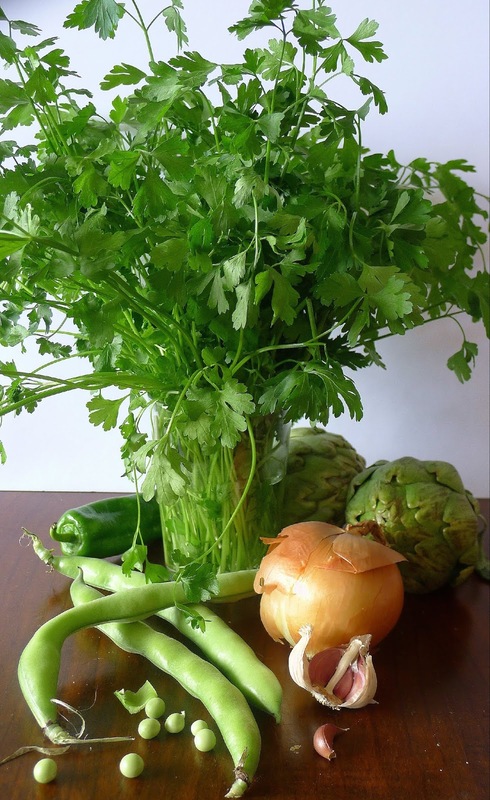 Lenten Fennel Soup with Beans. Fideo Noodles with Tofu and Vegetables. Savory Upside-Down Cake with Rice and Mushrooms. 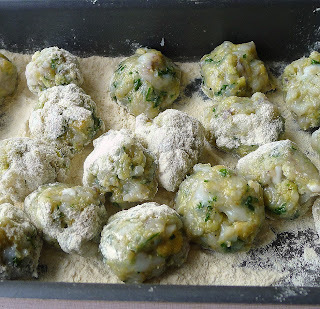 Another recipe with chickpeas and spinach: Chickpeas and Spinach with Cod Dumplings. One of my readers (an Australian living in Sevilla) once asked me for a recipe for solomillo al whisky—pork tenderloin in whisky sauce. I had never come across such a dish in Spain, so I suggested that whisky wasn’t Spanish and maybe he could use Sherry or brandy instead of whisky. Sorry, Ian, if I sounded like a silly know-it-all. I’ve since learned that pork in whisky sauce is muy sevillano, a popular dish in many tapa bars there. 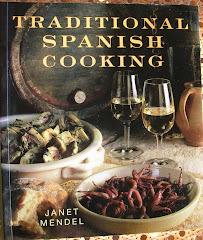 I’ve never, however, discovered how a sauce made with whisky—as in Scotch—came to be part of Sevilla cooking. 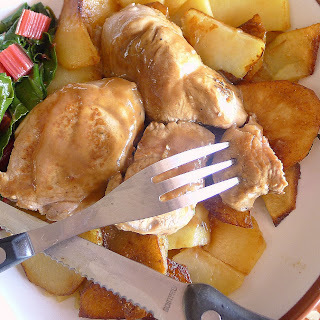 A popular tapa in Sevilla--medallions of pork tenderloin cooked in a whisky sauce. Just speculating: Maybe it’s because a cook ran out of brandy and decided to substitute some whisky in the sauce. Or, maybe it’s an indicator of the relationship between the Sherry trade and whisky distillers in Scotland. Sherry casks (Jerez, where Sherry is made, is very close to Sevilla) are used in ageing some of the finest whiskies. 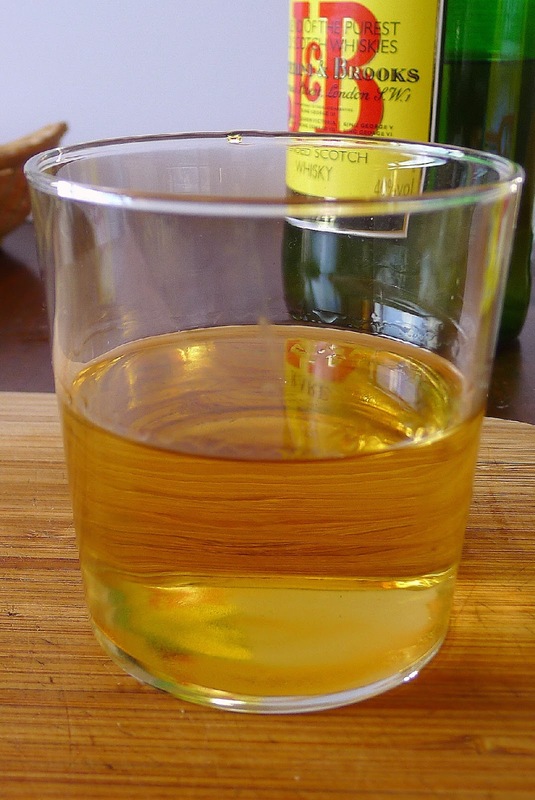 Or maybe a bar cook decided that cheap-o Spanish-made whisky wasn’t good enough to drink, but was fine for cooking. I’ve got to say, whisky makes great gravy! It’s easy to make and would go with almost any roast—beef, pork, turkey—or steak, chops. The only trick to this recipe is not over-cooking the pork tenderloin. Tenderloin is tender, but lacks fat to keep it juicy. Overcooking makes it dry. After searing, finish cooking the meat in the whisky sauce, but take it out when the medallions are still slightly pink in the center. Browning a wedge of onion in the oil before adding the whisky and stock helps to give the sauce a deeper color. The garlic cloves are unpeeled. That prevents their scorching and turning bitter. They can be skimmed out or served with the meat and sauce, as you prefer. 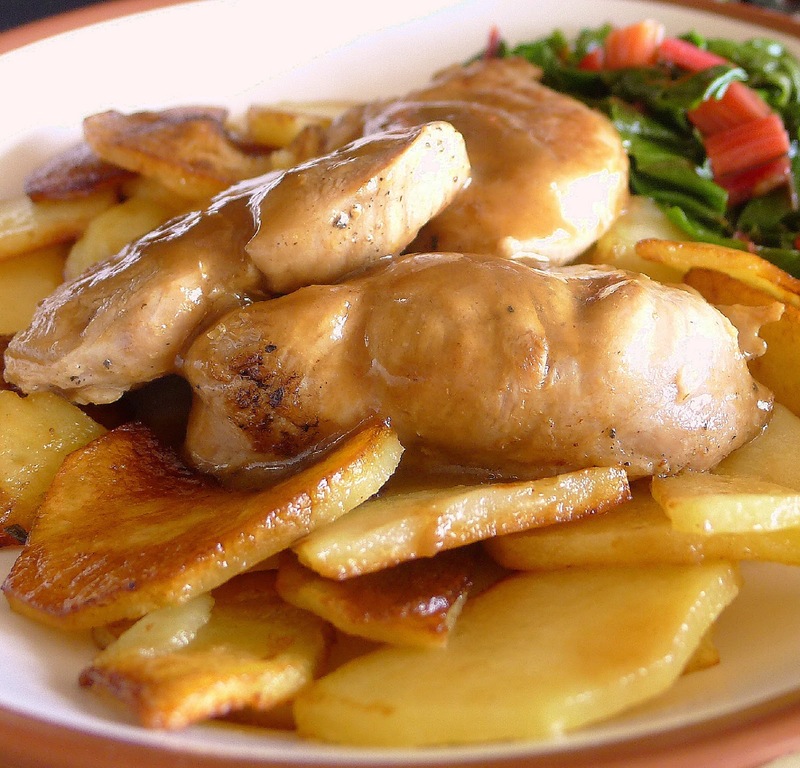 In Sevilla, pork tenderloin in whisky sauce is usually served with potatoes—fries, shoe-string, pan-fried or mashed. Plenty of bread, too, for the gorgeous gravy. 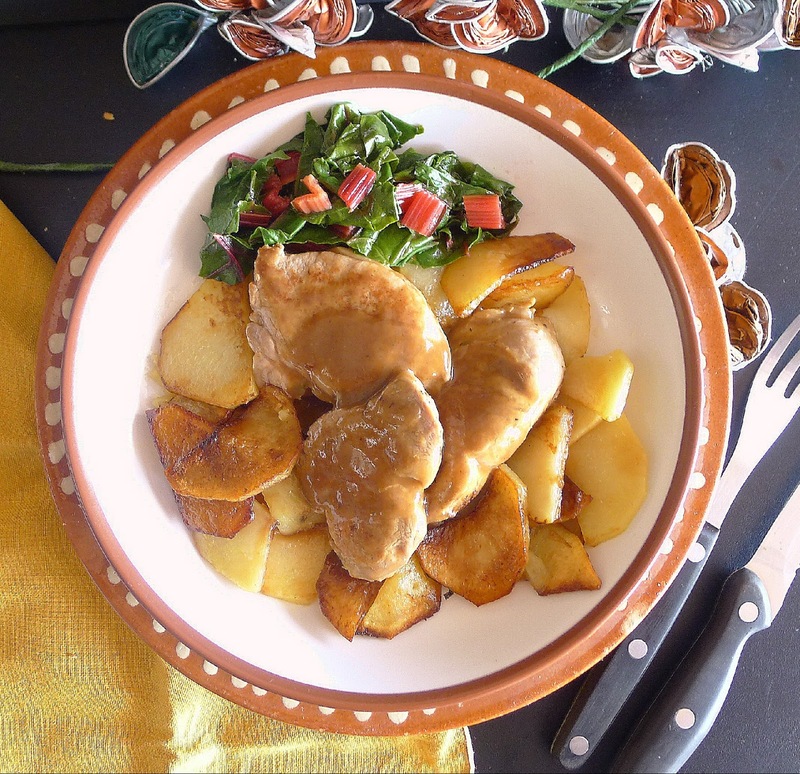 Velvety whisky sauce with the pork tenderloin and pan-fried potatoes. Red chard makes a nice side. Glass of whisky for sauce. Sprinkle the meat on all sides with salt, pepper, thyme leaves, lemon zest and 1 tablespoon oil. Allow it to come to room temperature (at least 1 hour). Cut the meat crosswise into 1-inch medallions. Brush a heavy skillet with 1 tablespoon of oil and heat. Sear the pieces of meat until nicely browned on both sides. The meat will not be cooked through. Remove from the skillet and set aside. Add 2 tablespoons oil to the skillet and reduce heat to medium. Lightly crush the cloves of garlic to split the skins, but do not peel them. Add to the skillet with the wedge of onion. Sauté, turning frequently, until onion is well browned. Add the whisky to the pan. Cook (or flambé) until alcohol is cooked off, 1 to 2 minutes. Scrape up any browned bits in the skillet. Add the stock and a sprig of thyme. Stir the cornstarch into ¼ cup water until smooth. Stir into the whisky in the pan and stir until sauce thickens and is smooth. Season to taste with salt and pepper. (If stock is salty, more salt may not be needed.) Add the lemon juice and the butter, if using. Simmer the sauce 10 minutes. Return the pork and all the accumulated juices to the skillet. Cook gently, turning the pieces once, until pork is hot and just barely cooked through, 3-4 minutes. Discard the piece of onion and sprig of thyme. Cloves of garlic can be left in the sauce, if desired. Serve pieces of meat and sauce garnished with chopped parsley. Pork Tenderloin with Cherry Ketchup. Pork Tenderloin with Plum Sauce. Just a couple weeks ago I proclaimed my love for meatballs. 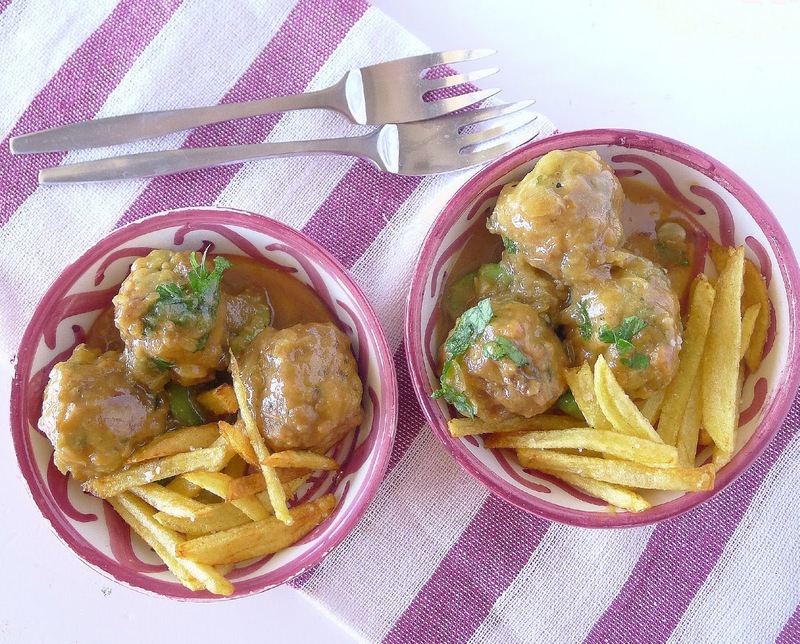 Then, I was rejiggering a classic Spanish tapas dish of meatballs in almond-saffron sauce. While I’m on a roll, I’m widening the meatball gyre to include this one, made with seafood. Balls are made of ground cuttlefish. The sauce has white wine and fish stock plus fresh fava beans. Albóndigas de choco are balls made of ground-up cuttlefish—choco is the name of the small cuttlefish, also called sepia or jibia. 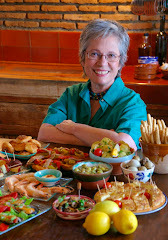 It’s a dish from Huelva, the westernmost province of Andalusia on the Atlantic coast. These seafood balls can be served as tapas. Here they're accompanied by fries. For a main course, serve the cuttlefish balls with white rice. Variation: add cuttlefish ink (from a packet) to the sauce and spoon it over the balls. Cuttlefish is a cephalopod (like squid and octopus), with the “shell,” or cartilage on the inside. The cuttlefish body is thick-fleshed, unlike the squid (calamar), so it’s perfect for grinding. 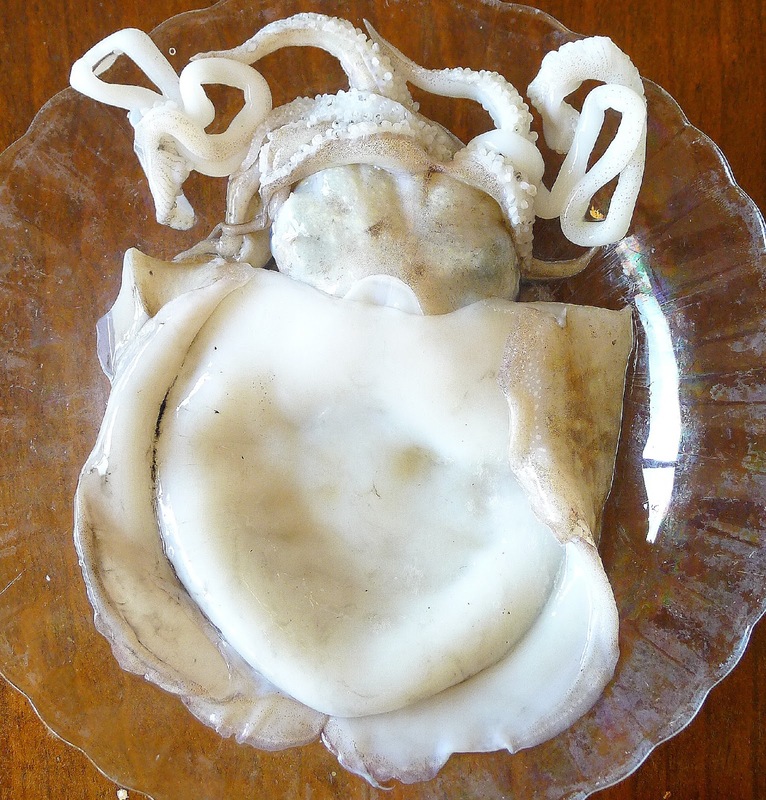 A cuttlefish cleaned of innards and cuttlebone, weighing about ½ pound. Uncleaned, these chocos at the market are not pretty, with traces of ink on their skin. Fishmonger will clean them. 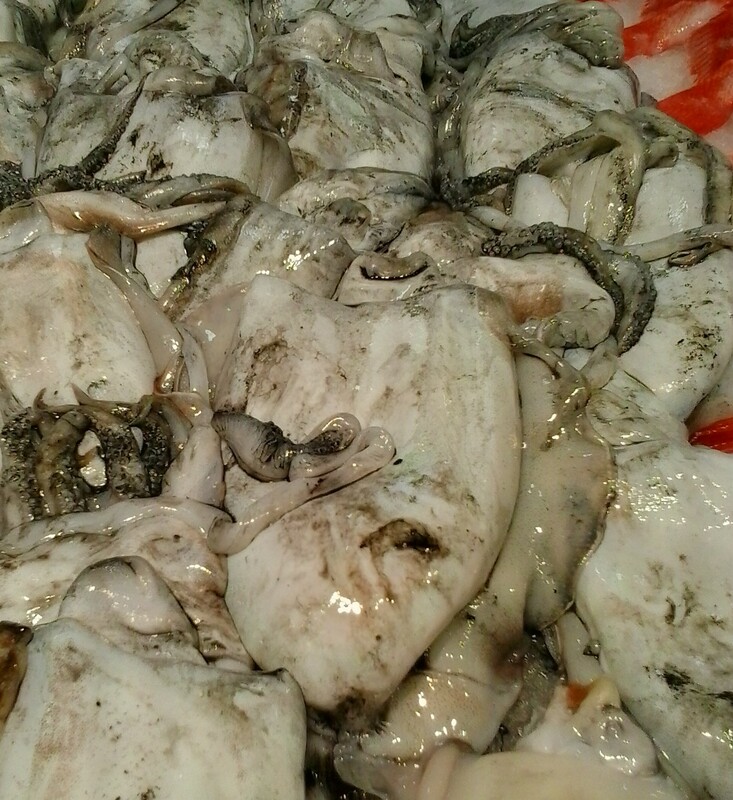 In Spanish markets cuttlefish is sold whole and uncleaned or completely cleaned and ready to cut up. You will need almost 2 pounds whole, uncleaned cuttlefish to make 1 pound, cleaned. Some versions of this recipe include a small portion of peeled, chopped shrimp added to the ground cuttlefish. A food processor is useful for mincing the cuttlefish, making bread crumbs, chopping parsley, garlic and onions for the sauce. The flour remaining after dredging the balls can be used for thickening the sauce. The oil in which they are browned can be strained and used for sautéeing the onions for the sauce. This cuttlefish balls in sauce may have fresh fava beans or peas added. 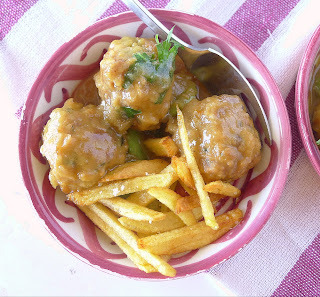 The dish can be served as tapas, accompanied by chunks of bread or patatas fritas, fries, or as a main dish with fries or white rice. A white wine with denominación Condado de Huelva would be perfect with this dish, but any fresh white wine will do. 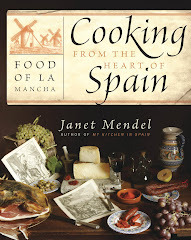 Fino manzanilla can be used instead of wine in the sauce. Cuttlefish body is thick. Cut into pieces before grinding in a food processor. Cut the cuttlefish into 1-inch pieces. Cut the bread into dice (3 slices should make about 2 cups, diced). Chop the parsley and garlic in a food processor. Add the cubed bread and process to make 1 ¼ cups coarse crumbs. Remove. Add the cut-up cuttlefish to the processor and chop to the consistency of ground meat. Beat the egg in a mixing bowl. Add the parsley-garlic-crumbs mixture. Season with salt and pepper. Mix in the chopped cuttlefish. Cover and chill the mixture for 30 minutes. Place flour in a shallow pan. Form balls and roll them in flour. 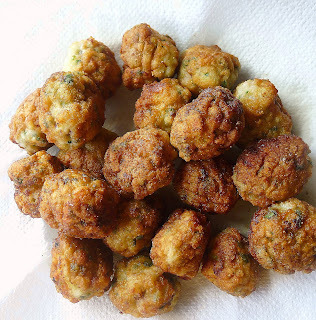 Dip hands in cold water and form walnut-sized balls with the cuttlefish mixture. Drop the balls into the flour and roll them to coat with flour. Cuttlefish balls are browned first. They finish cooking in the sauce. Peas or favas in the sauce. Heat the oil in a skillet and sauté the onion and garlic on medium heat until onion is softened, 5 minutes. Stir in the flour. Add the white wine and cook until alcohol is cooked off. If using saffron, add it to the stock. Stir the stock into the skillet. Add the bay leaf, chile, if using, and salt. Bring the sauce to a boil, then simmer, covered, 15 minutes. Add the fava beans and the browned cuttlefish balls. Cook on medium heat until cuttlefish balls are thoroughly heated, 10 minutes. Discard bay leaf and chile. 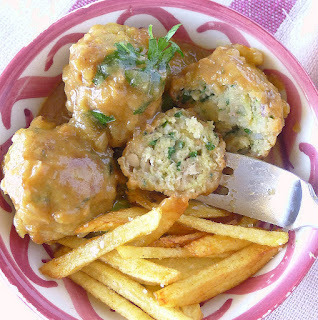 Serve the cuttlefish balls in sauce garnished with chopped parsley. Variation: After heating the cuttlefish balls in the sauce, remove the balls with a slotted spoon. Dissolve 2 sachets of cuttlefish ink in about ¼ cup stock or water and stir it into the sauce in the pan. 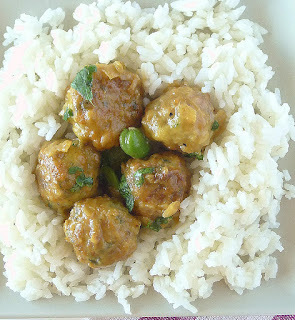 Serve the balls with white rice and spoon the black sauce on top. 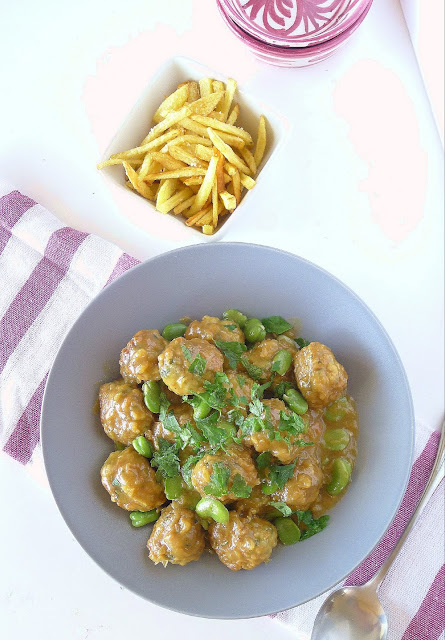 Meatballs in Almond Sauce (beef and pork). Leek and Meat Patties (lamb). Cuttlefish with Fried Bread Sauce. 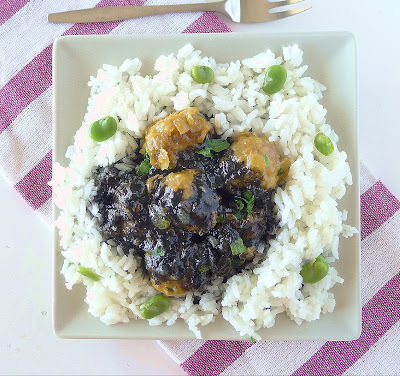 Rice with Cuttlefish and Peas. It´s Fallas in Valencia! Fallas is a week-long spring fiesta ending at midnight on San José day (March 19), where the protagonists are fireworks, firecrackers and giant bonfires to burn the fallas, or ninots, effigies, usually representing satirical and allegorical characters. The Fallas were originally a pagan festival marking the Spring equinox, a time for cleansing bonfires as fields were prepared for sowing. Over the centuries they became a popular fiesta incorporated into the Christian holiday of St. Joseph (which, by the way, is Spanish Fathers’ Day). Besides the noise of firecrackers and smell of gunpowder, the festival is full of music (brass bands at 8 in the morning! ), thousands of feria lights and good things to eat. 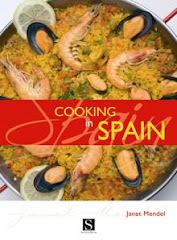 Being Valencia, of course there’s paella and other rice dishes. 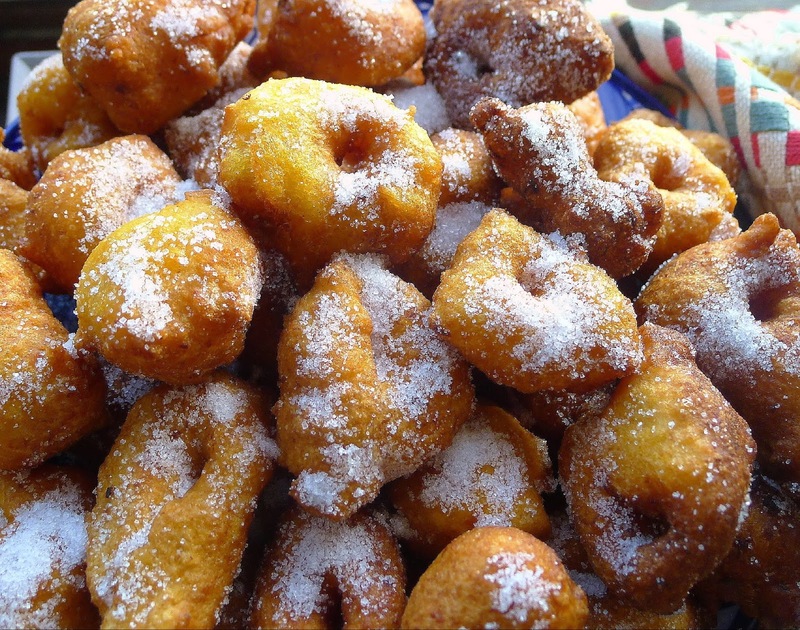 Street stalls sell sweets and holiday fritters such as buñuelos de calabaza. 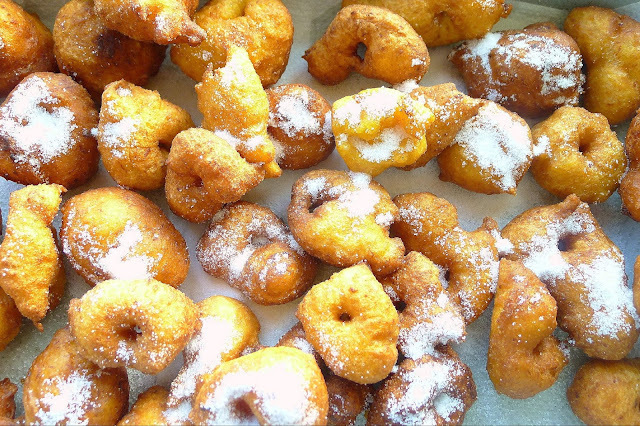 Buñuelos de calabaza are puffy fritters of fried dough that's made with squash. 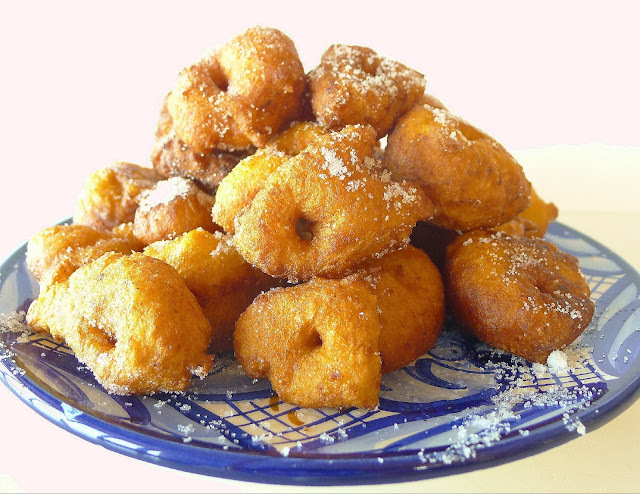 Buñuelos are small fried doughnuts made with a pumpkin batter. They’re delicious eaten out-of-hand or dipped in thick, hot drinking chocolate or, if the weather is warm, cold horchata, a sweet and refreshing drink made of tigernuts. I am terrorized by loud bangs, gunshot, firecrackers and the like. So I have never been to the Fallas in Valencia. But I’m celebrating with some quiet buñuelos with friends and family and touring the fallas--tableaux of images that will soon be put to the torch--on TV. Puffs of fried dough, sprinkled with sugar, are good dunked in thick, hot chocolate. The squash gives the puffs a nice color; grated orange zest flavors them. Puffs are spongy on the inside. Serve the puffs any time of the day. Breakfast? With a fruit salad. 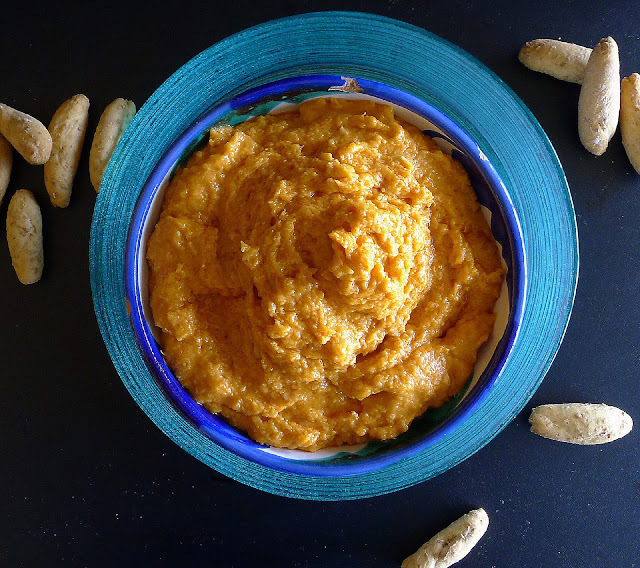 I made this with pureed butternut squash. 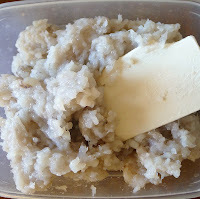 The directions for making the puree follow the recipe. You could also use unsweetened canned pumpkin. This recipe makes a soft, squishy yeast dough—more of a heavy batter than dough, really. The dough is formed into balls and a hole poked through them. They are then dropped into hot oil to fry until golden. To form them takes practice. My first two rounds were just misshapen puffs. It wasn’t until the third batch went into the hot oil that I managed to get my thumb through the dough to make a hole in the middle. It would be easier to have two people to make these—one with hands in the sticky dough, the other to turn the puffs and skim them out when golden. Another option: forget the doughnut hole. Use two spoons dipped in (cold) oil to scoop up a ball of dough and push it into the oil. Moderate the heat as needed so the balls don’t brown too fast, otherwise the dough will not be fully cooked. Serve the puffs at room temperature. They are best on the same day they are fried, but are pretty good the following day for dipping in hot chocolate. In a small bowl combine the warm water, 1 teaspoon of sugar and yeast. Stir and allow the yeast to set 5 minutes until it becomes bubbly. Put the pumpkin puree in a large bowl. Stir in the salt and orange zest. Beat in the yeast water. Use a large wooden spoon to gradually stir in all the flour. Use spoon or hands to thoroughly mix the dough until very smooth. The dough will be loose, more like a heavy batter than like dough. Place oil in a deep skillet or pan to a depth of at least 2 inches. Place on medium-hot heat. Place a bowl of water (for dipping fingers) near the pan. Have ready a skewer and/or heat-proof skimmer for turning and removing the puffs. Place a sheet pan covered with paper towels close at hand. Squeeze out ball of dough. With the left hand, scoop up a handful of dough. Squeeze the squishy dough in the fist, extruding a “bubble” of dough (about the size of a walnut) from between the thumb and forefinger. 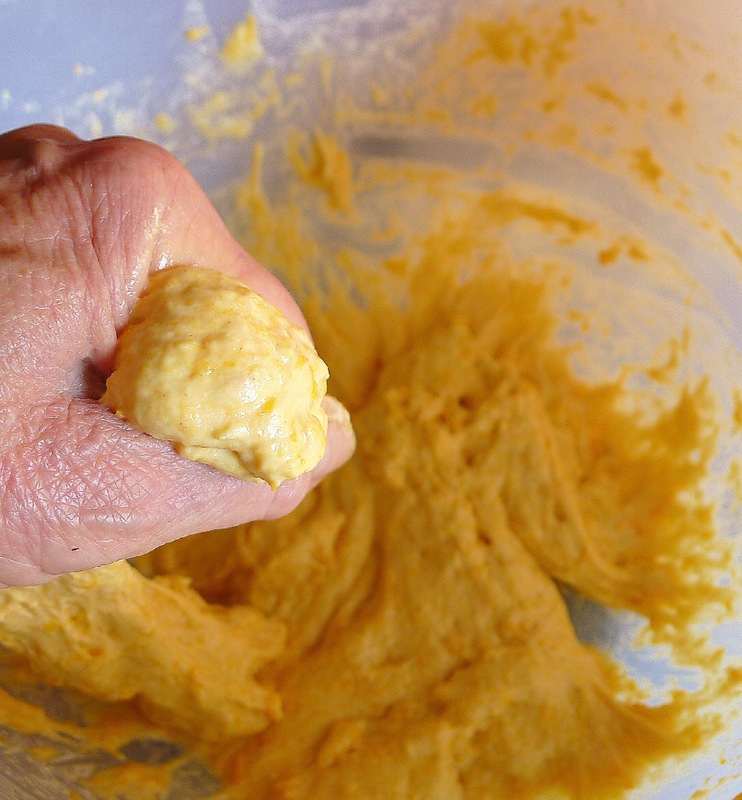 Dip the right hand in water and pinch off the ball of dough with the fingertips. Stick your thumb through the center of the ball. Let it stretch slightly as you (carefully) drop the dough into the hot oil. Continue forming the balls and dropping them into hot oil. Don’t crowd the pan. 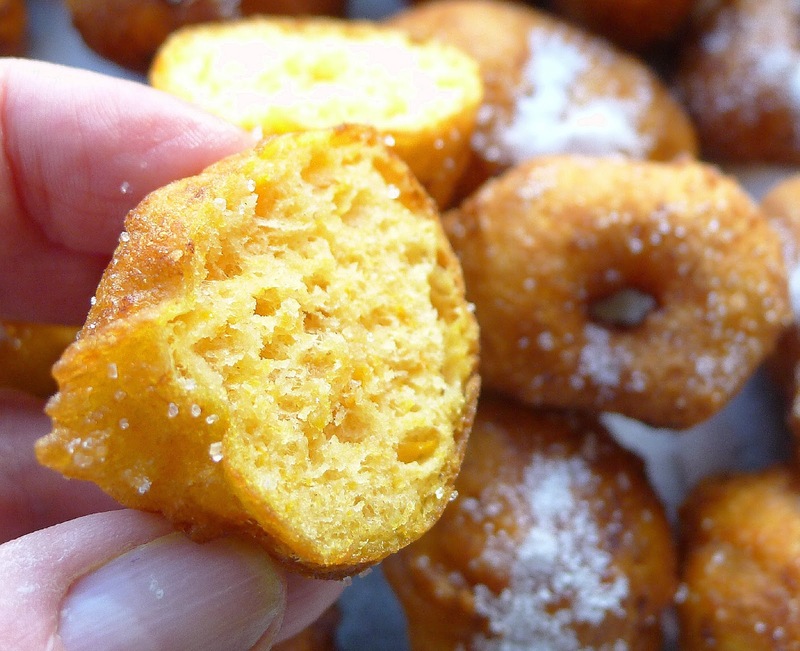 Skim puffs out of oil when they are golden-brown. When puffs are golden-brown on the bottom, use a skewer or skimmer to turn them. Remove them when browned on all sides and drain on paper towels. Regulate the heat so the puffs don’t brown too fast, or the dough will not be cooked all the way through. 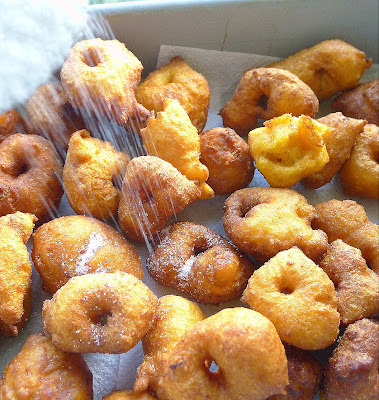 Continue frying puffs in batches until all the dough is used. Sprinkle the warm puffs with sugar. 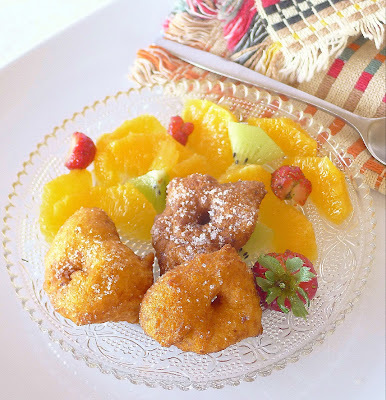 Sprinkle sugar on warm puffs. Hard-skinned pumpkin and winter squash are difficult to pare. But it’s easy to strip off the skin once they are cooked. I sliced the butternut squash and cooked it quickly in the microwave. You could also cook it in a little water or roast in the oven. Sliced squash is easy to peel after cooking. Cut the squash in half lengthwise and scoop out seeds and fibers. 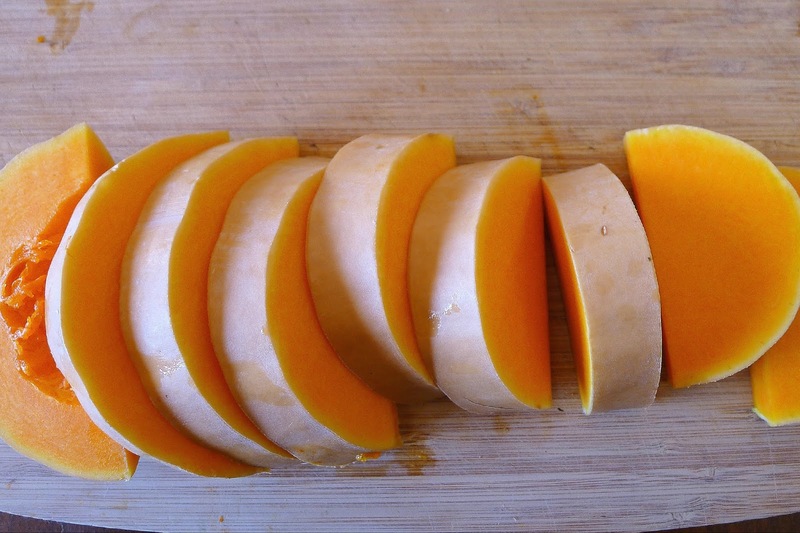 Cut the squash crosswise into 1 ½-inch slices. Place them in a microwave-safe bowl. Microwave on “high” for 5 minutes. Stir the slices to redistribute them. Microwave on high for 5 minutes more or until squash is very tender. When the squash is cool enough to handle, slice off and discard the skin. Drain any accumulated liquid. Mash the squash with a fork until smooth. It’s now ready to use in the puffs. Only about a third of my buñuelos have holes! It takes some practice to poke a hole in the dough and drop it into the hot oil. Also for dipping in drinking chocolate: Sweet and Crunchy Fried Bread. Catalan Custards with Burnt Sugar Topping.